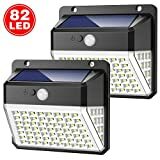 Solar Lights, Solar Powered Outdoor and Indoor lighting, Buy Now! Long Working Time: Up to 6-8 hours continuous working with a fully charged. The solar panel charge automatically during daylight even on cloudy days. IP65 Waterproof: Can withstand all kinds of weather, including heavy rain and snow, lighting for indoor and outdoor decorations. Easy Installation & Operation: Solar panel with a ground stake, 2 switch buttons, Power ON/OFF, Mode. ECO-Friendly: The solar panel absorbs and accumulates lighting energy during the day. Light sensor makes it be on automatically at dusk and also be off automatically at dawn. 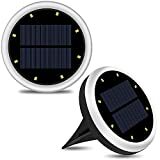 SOLAR POWERED & AUTO OPERATION: With a solar panel on the top and a rechargeable battery, this Solar Path Lighting turns on automatically and works for 8 hours at night if fully charged under sunlight during the day. It saves you from unnecessary electricity cost by maximizing natural energy usage. 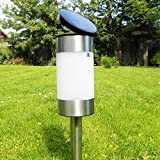 COMBINATION OF STYLE & DURABILITY: Featured by a stainless steel body and crystal lens, this Solar Garden Light is resistant to the influence of bad weather and corrosion. Besides, it blends well with your garden and path with its classic look. BRIGHT ENOUGH FOR SAFETY & DECORATION: With sufficient charge, this Landscape Path Light casts enough light to define and brighten your path, enhancing both visibility and safety. 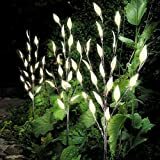 Besides, the dimpled lens makes the light project in all directions, adding a beautiful spiral-like glow to your garden. 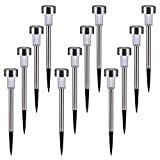 EASY INSTALLATION & MAINTENANCE: No wiring is needed for the installation of this Solar Garden Stake Light. Simply pull out the bottom spike, install it, and insert the light into the ground. And the durable housing means that little maintenance is required. 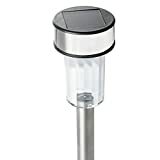 CUSTOMER SATISFACTION MONEY-BACK GUARANTEE: If you are not satisfied with the Stainless Steel Solar Path Light, just return them within 30 days for a full refund. No questions asked, no hassle. 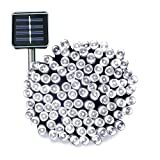 Click the Add to Cart button to have your Solar Path Light shipped today. 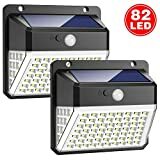 【Ultra-Bright Solar LED Lights】 Solar pannel lights with 28 bright LEDs and the motion angle is 120 degrees which can provide excellent illumination and turn the dark space into a bright lighted space. 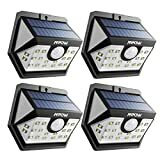 【High Efficiency and Eco-Friendly】 By expousring to sunlight for around 8 hours in daytiome, the outdoor solar lights are able to work for you by motion detecting at night. 【NO DIM MODE】 To increase home security and product life span, this security lights are designed without dim mode. It will only be activated after movement is detected in dark then auto turns on. After lighting around 30 seconds, it turns off automatically. 1m Cable From The First Branch To The Solar Panel . These striking 3 solar LED branch lights by Livivo in a stylish beautiful branch design. Practical for lighting up your garden, paths or borders around your home. Each branch has 20 pre-lit LED's which will blend lovely into your gardens surroundings. 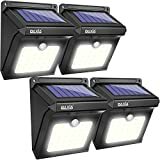 These Solar Powered Deck Lights are ideal as a marker light along pathways, decking, driveways, patios, borders etc. 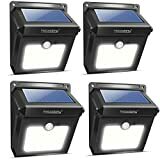 Long Working Time & Greater illumination brightness: Solar Path Lights with 8pcs LEDs its brightness is up to 96lm, built-in 1200mAh rechargeable battery, it only needs 6-8 hours to be fully charged and can last for about 60 hours working time. Sensitive Light Sensor & Better Protection Design: External waterproof switch, instead of pinhole switch, easy to operate, IP65 waterproof and aluminum to make it suitable for outdoor use. Can effectively isolate water mist, rust-proof. Easy Installation: No Screws and no wires needed, Upgrade version bracket edge heightening can prevent deformation and bending. 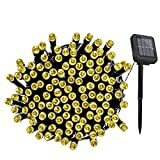 Solar powered LED string lights, cost effective and energy efficient get fully charged about 6-8hours under the strong sunlight; about 10 hours usage. 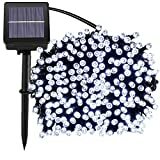 120 Led / 20 Feet solar string lights, easy operation and alternating in 3 modes-press the button once-steady on, press twice-flash, press the third time-off; auto on at night; auto off in the daytime, power saving enough, add a fairy touch to your home and business. 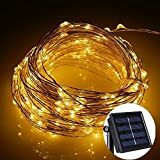 200 SUPER BRIGHT LED LIGHTS: This Amir solar string lights with 200 LED bulbs on 72ft high quality lead cable, will always meet to your demand. 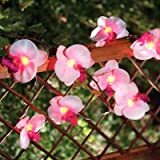 With these fairy string lights, you can perfectly decorate the gardens, patio, porch, gate, adding some dreamy touch to your big event. 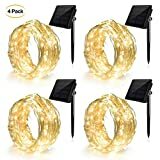 8 IN 1 DESIGN: This Solar Fairy String Lights with 8 Modes, included Combination, Fireflies flash, Waves, Fade, Marquee, Slow Fade, Twinkle Marquee, Continuous.You can create different atmosphere by changing the brightness level and the mode. Dim light fading for resting or high light flashing for dancing party. 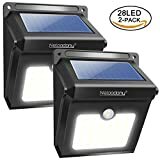 SOLAR POWERED: This outdoor Solar lights does not need battery replacement and charge even on cloudy days.Turn on automatically at dusk with bright light color. 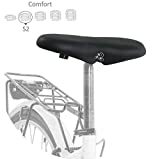 Have best performance when you place it in an open area with direct sunlight most of day. It can continuously work more than 8 hours at night if the panel absorbs enough sunshine during day. 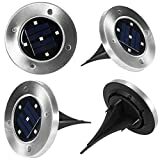 AUTO SWITCH: This solar LED string lighs has safer and reliable design - Auto switch, Auto lights up at night/ Auto off at sunrise. 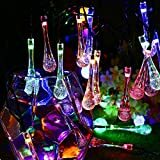 It is suitable for hfor Christmas, Garden, Home, Patio, Party, Bedroom, etc. WARM WHITE + 22M: Simple and easy to use. 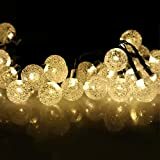 The LED String Light is for all ages, 72ft 22m. For the first time use, please charge the solar product by placing it under direct sunlight for more 8 hours before using. Solar Energy Charge: Powered by solar energy, which is energy saving and e friendly. Waterproof: IP44 waterproof rating, which means it can be suitable for outdoor decoration. Memory Function: The mode will be stay the same you set at the last time. Working Time: Illuminates up to 12 hours at night if the solar panel get full charged during the sunny daytime. 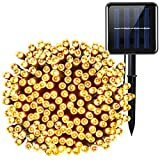 SOLAR POWERED: this energy-saving solar string lights includes a rechargeable solar cell, which is charged through converting solar energy into electricity during day time, without any additional cost required. TWO DIFFERENT MODES: steady-on mode and flash mode to create different atmospheres. 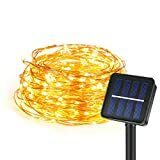 EASY INSTALLATION & OPERATION: it's easy to decorate your outdoor space with this solar string light, without any other electric wire needed. There are only two switch (Power ON/OFF and Light Mode) to control the light easily. Expose the solar panel to direct sunshine and make sure the solar panel faces right to the sun. 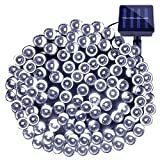 LONG LIFESPAN and 2 YEARS WARRANTY: with high converting efficiency, this solar string light may work for 8-20 hours a time, varied from intensity of sunlight, the volume of solar energy stored everyday and the mode selected; with waterproof design, this solar string light may be used for at least 40,000 hours. 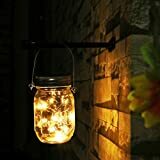 IDEAL for OUTDOOR DECORATION: no matter where this high quality solar string light decorated, it is able to create warming, sweet and romantic atmosphere, especially in festivals. 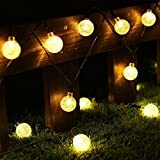 200 SUPER BRIGHT LED LIGHTS: This solar string lights with 200 LED lights, provide a warm and romantic atmosphere for your home, patio, garden, pathway, gate and so on, also as a decoration used for varied festival parties, Christmas, even the wedding. 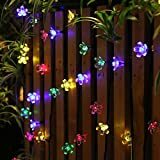 8 IN 1 DESIGN: This fairy starry lights with 8 modes and different brightness level by the two button back of the solar panel, then you can control the string llights easily. About: Combination, Fireflies flash, Waves, Fade, Marquee, Slow Fade, Twinkle Marquee, Steady. 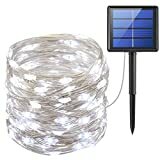 72 FEET LENGTH + 20M: Solar Fairy Lights on 72 Feet Long Ultra-Thin Sliver Wire, which is simple and easy to use. The sliver wire light is durable enough to design any shapes you've been dreaming of. 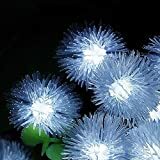 WATERPROOF IP65: Amir solar lights garden is designed to be used outdoors, even in the rain day, you can still see the romantic light spinning from of your eye in. Not overheat because of the copper wiring is insulated. 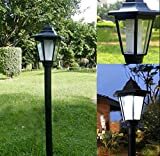 SOLAR POWERED: This outdoor lights does not need battery replacement and charge even on cloudy days. Turn on automatically at dusk with bright light color. Have best performance when you place it in an open area with direct sunlight most of day. It can work up to14 hours after fully charged (8 hours). High Conversion Solar Powered Design: solar power replaces battery and electricity, save money on energy. 8 Modes Choose: fireflies flashing, waving, fading, chasing/flashing, slowly fading, twinkling/flashing, steady on and off. A variety of lighting modes, choose any one you like, makes your home or garden more romantic and beautiful. 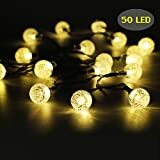 100 brilliant LED Lights: 100 LED string lights on 39ft high quality copper wire provides you a beautiful and fairy world. 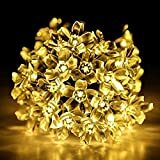 Ideal for decorating your home, garden, Patio, lawn, gate, yard, party, wedding etc. 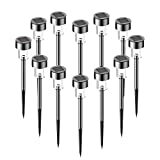 Improved Waterproof Durable Solar Lights Garden: Made by long lasting durable copper wire high conduction for energy efficiency, it can be exposed to thunderstorm rain. 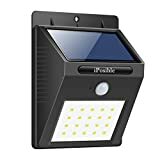 Apply to indoors & outdoors, provide nice, soft and delicate warm white light for your pathway, window, patio, fence, garden, porch, clubhouse, pool, bushes, yard etc. Flexible & Easy Using Copper Wire with Different Shapes: They are tiny LEDs on a wire that allows you to bend it around the object or area that you wish them to be and are a good length to allow some creativity. Perfect for a star effect around the roof because they are 12m long enough and tied in place without having to screw or nail them to the supporting structure. Solar stainless steel wall lights. Powerful led, no wiring or batteries required. Automatic night time illumination. Extra motion sensor light. Waterproof, 6-8 hour night illumination. Each light measures: 255mm high x 76mm wide. 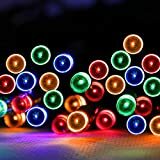 300 LED Multicolor Solar String Lights, Fantastic 8 light effects with memory function. 80% Larger than ordinary solar panel, more powerful and more efficient. Power by 18650 Lithium-ion Battery, high capacity battery works better results. Upgrade with Micro USB charging, the perfect solution for use under extreme weather. IP44 waterproof suitable for indoor and outdoor use. Perfect for brighten Your home and garden. 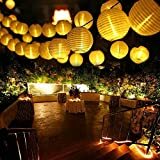 Multipurpose - Ideal for creating that special magical mood for parties, porches, pergolas, ponds, trees, tents, walls, sheds and just about anywhere else you can think to use them! Free to run - No running costs, no expensive wiring and absolutely no mains electricity required. LEDs need hardly any energy and the light bulbs last a lifetime so you don't ever have to replace the bulbs like you do with conventional lighting systems. 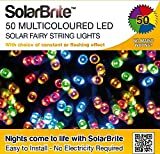 Eco friendly - Go green this year and save 100% on energy costs with these high quality solar powered fairy lights. 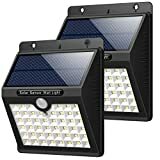 Solar lights really are a great option not only for the home and garden but for the planet as well. Easy to install - Solar Brite is easy to set up. Simply remove from the packaging and put them wherever you desire. The light string is 5 metres long with an additional 2 metres wire for positioning. 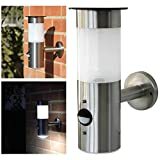 The lights come with a choice of wall mount and garden stake for you to choose any position and move easily if you so desire. Choose an effect - the panel comes with a switch to choose from flashing or constant light. The panel also gives you the option to turn the lights off if you wish to. When 'on' the sensor in the panel automatically turns the lights on when it gets dark.